The Relentless Stock Market And Missed Calls! Brilliant professional money managers fail in their market timing. For individuals it is even harder to engage in market timing. An eye on the three key supports for the stock market can be helpful. The market may be closer to a pullback, but the Bull is not ready to rollover yet. The Precarious Market! Or is it? Since last year, there have been a number of prognostications on the precarious state of the stock market. And these have been wrong! Even legendary figures with prescient calls earlier have erred and most likely suffered in returns from their predictions. These are just a few notable investors whose market prediction calls have not quite worked out yet even though they presented reasonable arguments. Keep in mind that these elite investors make major calls and invest billions, and have been very successful at it. In addition, they are not required to update when they change their mind. The above instances demonstrate how hard it is to call the market top and an ensuing correction or bear market. When professional investors are finding it difficult to be right, the task is even steeper for individual investors who are trying to grow their hard-earned money with far fewer research resources at their disposal. Market timing can be a frustrating and costly exercise for individual investors. This market has been even harder to call, and to no small extent due to an atypical President. In our past writings, including Return of the Fundamentals and more recently Is the stock market heading higher, we have drawn attention to the three key stock market pillars that are a helpful guide for individual investors to calibrate their investment strategy. These are the three key pillars that underpin a stock market. The rest of the news eventually has to distil down to how it impacts these three key supports. And if it doesn't have a meaningful impact over the next six months, then most likely it is just noise. Investors can be served well most of the time by looking through a lens that combines these three key factors when studying the stock market. At this time, all three continue to be supportive of valuations. We have used these over the years to calibrate our portfolio response and significantly outperformed the markets on our Graycell Small Cap Portfolio, including a 71% gain last year compared to benchmark Russell 2000 (IWM) gain of 22%, S&P 500 (SPY) gain of 12%, and Nasdaq (QQQ) gain of 8%. It should be kept in mind that being supportive doesn't mean a straight ride up. Instead, it is suggestive that the broader market uptrend remains firm and any pullback, when it occurs, will be short-term, shallow, and a normal cyclical one, before the market resumes its uptrend. When underpinnings are strong and do not show deterioration, it is hard to make a case for a major correction, which would be a decline in the mid-to-high teens or worse a bear market. S&P 500 earnings have already grown at above 4% for Q4:2016 and Q3:2016, the first time that the market has witnessed two consecutive quarters of Y/Y earnings growth since Q1:2015. Here's a striking chart which shows the earnings performance of the major sectors for the last quarter, and explains the momentum in earnings. 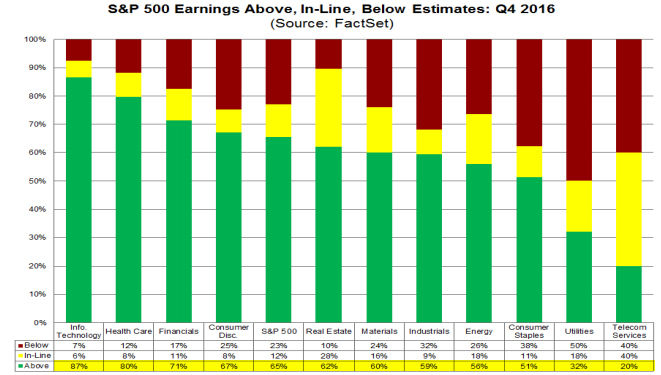 Most of the sector earnings were ahead of expectations, with Technology, Healthcare and Financials leading the charge. The earnings growth is now accelerating, with a 9% growth anticipated for Q1:2017, the highest since Q4:2011, as per Factset. The S&P 500's P/E valuation has climbed higher and is bordering at 18x based on forward earnings estimate of $131.11, according to Factset. The P/E is above the 5-year average of 15x, and the 10-year average of nearly 14x. The faster rise in the ratio can be of concern and partly explained by the expectation of pro-growth policies which is causing valuations to move faster than earnings. The higher ratio can suggest a pause may be warranted, but at the same time is not high enough to suggest a euphoric rise in valuations that can presage major market shifts. The broader economic picture continues to be steady and favorable, with a preponderance of evidence suggesting that economic growth is expected to continue. Consumer and business spending are critical for a growing economy. Various sentiment indicators consistently remain strong and close to highs. Quite importantly, the executive business sentiment at the largest corporations has improved markedly to the point of having a meaningful impact on business spending, investments, and employment. The Business Roundtable's CEO Economic Outlook Index surged in the latest reading reported last week, its biggest increase since the end of 2009. Furthermore, the gauge at a reading of 93 is well above it long run average of 80, a feat not recorded since first-half of 2015. This bodes well for business investment spending, which has lagged and has only begin to turn around in the final quarter of 2016. Confidence and sentiment measures can be volatile and turn fairly quickly. But there appears to be a durable pattern of high readings that are being recorded this year, consistently across various measures. The final key pillar also remains supportive of valuations. Interest rates are rising, but that by itself is not the death knell for the bull market. The financial markets always fear a rapid and untimely tightening of interest rates by the Federal Reserve for it runs the real risk of choking up the economy and raising the probability of a recession. It is the probability of a looming recession that most often drives bear markets and deep corrections. At this time, the Federal Reserve appears to pursue a cautious and calibrated approach, which compensates on the side of conservatism. In the FOMC statement and the follow-up press conference, it was abundantly clear that the Federal Reserve anticipates a gradual path of interest rate increases. To fret about rising interest rates is a misplaced concern at this point. This can change if there are a couple of earlier than anticipated increases. But for now, the monetary policy remains supportive. There is no dearth of worrisome headlines for investors to wake up to each morning. Positive news or progress is typically more gradual, like the constant and gradual improvement in nonfarm payrolls over the years, and so less noticeable. Stock markets typically climb a wall of worry, and it has been no different this time. However, in spite of a steady and forceful rise over the past many months, the stock market does not yet conjure up an image of excessive valuations. In other words, there is nothing euphoric about this rise. But at the same time, the investor sentiment has been relatively muted. 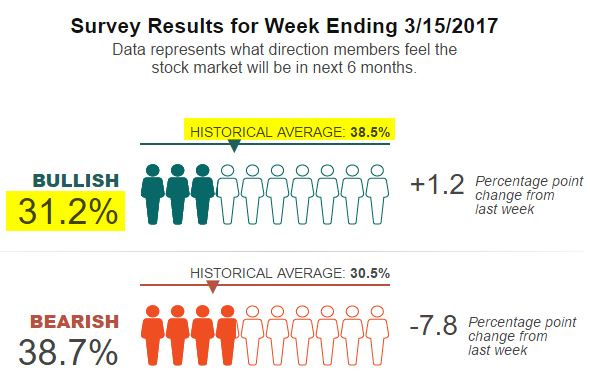 The AAII Investor Sentiment Survey continues to indicate a bullish sentiment reading, which is below historical averages. It should be kept in mind, the individual investor sentiment is a contrarian indicator. So a high level of bullishness or bearishness, suggested by consistent readings in the 50s and higher, points towards a higher probability of a change in trend. A bullish market top is typically suggested when there are excessive and persistent bullish sentiment readings, which is not the case here. The market may be setting itself up for a normal pullback. It is but natural for the chances of a pullback to rise after a relentless and uninterrupted rise. This pullback will be triggered most likely by scaled down expectations of pro-growth policies. But the stage is not yet set for the Bull market to die. That will require more systemic reasons, like a faltering economy or disappearing earnings growth or a much faster pace of tightening which chokes up the economy. Sometimes staying the course is the best option when Earnings, Economy and Monetary policy appear supportive. That would have allowed an investor to maintain a certain level of exposure to stocks over the past many months. There are always negative reasons to stay away from the market, which feed into our behavioral biases and fear of the unknown. The last drawdown always remains fresh in our minds, affecting decision-making. In fact, drawdowns are there a majority of the times, as was highlighted in our article, Living in a Drawdown State. The potential failure of the ongoing effort to repeal and replace the Affordable Care Act (Obamacare), can cause ripples in the stock market and may be an excuse for a pullback. The small caps have already been in a consolidation phase this year, suggesting a leveling out of risk appetite. But the market fundamentals appear to be sufficiently strong at present for any long-lasting impact from a potential failure of the passage of Trumpcare / Ryancare Bill. The new healthcare bill may have limited read through for the Biotech (IBB) (XBI) (LABU) and Pharmaceutical (XLV) sectors. A key driver for pro-growth policies will be the corporate tax cut plan, and that is where the investor focus will remain. We are presently 80% invested in the Small Cap Portfolio and fully invested in the 8-stock Prudent Biotech Portfolio, which is up 26% for the year as of the end of February. We recalibrate our position as market conditions evolve.